Asurgical 5-1 dismantling of arch rival White Bear Lake in the Section 4AA final gave Hill-Murray plenty of lead time in putting together its state tournament preparations. Which isn’t to say the Pioneers were looking past the Bears while still playing them, but they needed only a few minutes – just enough time to gather their sticks and gloves and leave the State Fairgrounds Coliseum ice surface – to switch into state tournament mode. Hill-Murray, which won the state Class AA title in 2009, is making its fifth straight state tournament appearance. Other than Minnetonka, no team enters the the state tournament with fewer losses than the Pioneers (25-2-1). 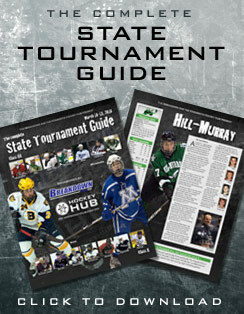 Hill-Murray, ranked fourth in the Hockey Hub’s final state Class AA poll, received a No. 4 seed behind Minnetonka, Edina and Blaine, respectively. The Pioneers’ two losses came against Blaine during the Schwan Cup and Class A powerhouse St. Thomas Academy late in the season. After beating White Bear Lake and before the state tournament seeds were announced, Lechner said he wasn’t too concerned where the Pioneers were slotted. “Not really, the only thing is that whoever gets the (No. 2) spot plays at 11 o’clock in the morning,” he said. “I’m not in love with that. The Pioneers have a deep and balanced lineup of scorers, led by Willie Faust’s 22 goals and 44 points. Seven Hill-Murray players have scored 10 or more goals, including standout defenseman Chris Casto (13 goals, 18 assists), a Minnesota-Duluth recruit. Kevin Becker led Hill-Murray during the playoffs in goals (four) and points (eight), and Tim Shaughnessy has allowed just one goal in his last 10 periods, dating back to the regular season.